Koh, Kyungwon. “Radical Change Theory: Framework for Empowering Digital Youth.” Journal of Research on Libraries & Young Adults 5 (2015): n. page. Web. <Date accessed>. Eliza T. Dresang influenced numerous researchers and professionals by equipping them to understand and better serve digital youth. This paper revisits her theory of Radical Change, which explains the synergistic combination of changing resources and youth in the digital age. The presented research applies and extends the theory by investigating the information behavior of digital youth. The study has two phases —Phase 1: content analysis of research literature; Phase 2: group and individual interviews with young adults who are members of an online community called Scratch. Selected findings illustrate the ways in which digital youth have an increased sense of control over learning, creative, and social aspects of their life. The study demonstrates that Radical Change theory provides a unique perspective to ferret out the potential of non-traditional information behaviors. The theory continues to be a tool for enhancing a sense of agency for digital youth by increasing their capacity to learn, create, and socialize. Future research applying the theory could explore how the dynamic interactions between changing resources and youth may have an impact on youth obtaining twenty-first-century skills. Q1. What is the theory of Radical Change? Q2. How does the theory help us understand the information behavior of digital youth? That is, what radical changes do contemporary youth experience when they interact with information? Q3. What does the future of the theory look like? To answer these questions, I begin with a review of Radical Change theory and research that has applied this theory. I will then present selected findings from my dissertation research, which was conducted with the guidance of Eliza T. Dresang. I had the privilege of working with her directly and take up her pioneering work of Radical Change by applying, testing, and extending the theory. The findings demonstrate the value of the theory in explaining the information behavior of digital youth. This paper concludes with a look toward the future of the theory. The emphasis of this paper is on the theory’s perspective on youth empowerment, as Dresang had always strived for empowering youth through her scholarly, professional, and personal achievements. The theory of Radical Change is fundamentally grounded in her belief in “the child-as-capable-and-seeking-connection.”1 This paper proposes the future of the theory as a tool for enhancing a sense of agency of digital youth. Radical Change theory suggests that many of the changes in information resources and human behavior in this digital age can be explained through these core concepts: connectivity, interactivity, and access. While the theory is currently being used to investigate both resources and behavior, it was originally developed to explain changes in youth literature. The theory’s explanatory power to study human behavior was revealed later by research studies that applied the theory across disciplines, such as library and information studies, education, and English. Children are capable and are seeking connections. The digital environment nurtures children’s capabilities. Handheld books offer digital-age connections. Connectivity: A sense of community or construction of social worlds that emerge from changing perspectives and expanded associations in the real world or in literature. Interactivity: Dynamic, user-initiated, non-linear, non-sequential, complex cognitive, emotional, and physical behaviors and relationships with and among components of literature. Radical Change is still the only widely used theory that makes this connection between printed literature for youth and the digital environment. Radical Change theory was also used to study reading behaviors of adults. Marta J. Abele observed pre-service teachers’ responses to children’s books with Radical Change characteristics. The pre-service teachers not only recognized differences between Radical Change books and more traditional children’s books, but also positively responded to the books with digital characteristics. Abele reported that Radical Change books require a higher level of interaction for readers and that the books would make good partners with technology in classroom teaching to attract digital youth.9 These research studies from different disciplines reveal the theory’s applicability to human behavior in general. The versatility of the theory’s potential applications was suggested to explain a range of contemporary information behaviors.10 Dresang demonstrated how the theory provides a new perspective to explain the information behavior of youth in the digital environment by reexamining existing studies on the topic. She found that many of the studies tend to focus largely on the deficiencies and the need for improvement instead of recognizing the potential of new and non-traditional behaviors in this digital age. She suggested that “to view youth information-seeking behavior as generally lacking is to overlook the new behaviors nurtured and facilitated by the digital environment and to miss the golden nuggets embedded in these studies.”11 The study presented in this paper attempts to report some of the “golden nuggets” using the theory’s unique perspective that empowers youth. The theory argues that behaviors that were previously interpreted as a lack of skills or failure might be understood as new types of thinking and learning, which reflect properties of the digital society. What are the key characteristics of information behavior of youth in the digital age? 1.1. How do youth act independently? 1.2. How do youth form identity and perceive others? 1.3. How do youth interact socially with others? How can Radical Change Theory be applied and further developed to explain youth information behavior in the digital age? Phase 1 findings were tested in Phase 2 with a purposeful sample of youth, ages 12–15, who actively engage in digital media practices using Scratch. Scratch is a graphical programming language, also referred to as an online community for Scratch users, developed for youth to create various digital projects—such as interactive stories, games, simulations, magazines, animations, music, and art—and to share these creations on the Web.14 Scratch was identified to be an exemplary place to investigate Radical Change information behavior of youth, because Scratch members formed a vibrant community to create various user-initiated projects using a highly interactive programming tool. Different from a traditional text-based programming language, Scratch takes the building-block approach: users create programming scripts simply by dragging and dropping colorful building blocks that indicate different commands. Scratch also makes it easy for youth to import, combine, and create sound, image, and video within the program. It has been used in schools, universities, libraries, and everyday life to promote young people’s twenty-first-century learning skills, such as computational skills, collaboration skills, and information and media literacies. Youth who are active members of Scratch were recognized as likely to be capable of providing deep and detailed descriptions of the topic, since they are heavily immersed in digital culture and engaged in active information behavior embedded in digital media creation practices. The researcher identified three of the most information-intensive projects in the Scratch community: the Interactive Journalism Institute for Middle Schoolers (IJIMS), Scratch Wiki, and Scratch Resources. The goals of IJIMS included developing middle school students’ interests in twenty-first-century writing, media, math, and computing skills through interactive journalism and digital storytelling.15 The IJIMS students created an online magazine using Scratch and other digital media in a collaborative setting. They conducted interviews with members of the community, wrote articles, and worked as a group to create an interactive magazine with assistance from teachers and undergraduate mentors. Young Scratch members voluntarily initiated and maintained Scratch Wiki and Scratch Resources. Scratch Wiki is an information website where Scratch members share information on various aspects of Scratch. Scratch Resources is a digital media library developed to share tutorials, characters, and sounds, which is also contributed to by members of the Scratch community and can be used for Scratch projects. The study findings identified the patterns of information behavior that represent the concepts of Radical Change theory: connectivity, interactivity, and access (see table 1). 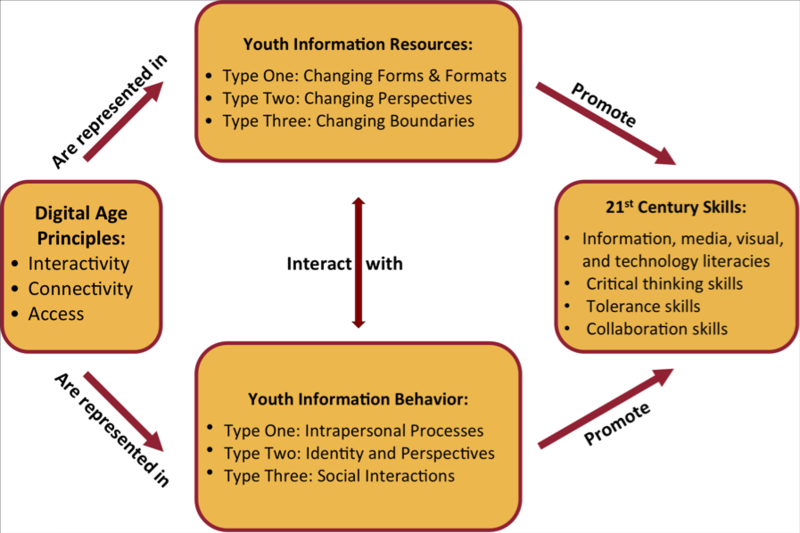 The findings suggest a holistic perspective for observing youth information behavior as interplay between various factors, such as young people’s (a) intrapersonal processes, (b) identity formation and value negotiation, and (c) social interactions. The findings propose that digital youth engage in non-linear and interactive information seeking, use, and creation activities with an increasing sense of ownership; they form identities and negotiate value systems while they interact with a range of information from different, often conflicting, information sources; and they expand the boundaries of interpersonal information behavior by connecting to diverse resources, people, and communities to meet their information needs. Type One: Intrapersonal Process Personalizing The design of one’s own information environment to facilitate access to and use of information concerning personal interests. Interactive seeking Dynamic, fortuitous, and self-controlled information seeking behaviors. Squirreling The way youth extensively gather and keep information in the digital environment in the form of downloading. Remixing The creative reuse of information in order to produce new information or expressive materials. Tinkering Interactive mode of information production, which starts as an idea and the idea evolves by continual modification, trials and errors, and experimentation. Type Two: Identity and Perspectives Self-expression The ways youth express themselves by producing and publishing information that reflect their identity and perspectives to the connected information world. Seeking Identity-related Information Information seeking regarding identity issues such as gender, race, and sexuality. Negotiating Value Systems The ways youth process diverse perspectives and deal with ambiguity when interacting with various information, people, and communities. Sense of Empowerment A greater ownership and a sense of agency over information activities as a result of new and innovative behaviors and the nature of the information environment in the digital age. Type Three: Social Interactions Networking The act of reaching and connecting resources, people, and communities to meet one’s information needs through technological networks, such as the Internet or mobile networks. Collaborative Problem Solving Information behavior performed by two or more people working together in order to complete tasks or develop new information. Socio-emotional support The ways youth exchange non-work related comments or actions to build rapport and trust during collaborative/collective information behavior. This section presents selected findings from the study. These are characteristics that clearly represent the concepts of Radical Change theory when digital youth learn, create, and socialize. Interpreted through a lens of Radical Change theory, these behaviors have the potential to enhance a sense of agency in youth. Substantiated examples are from both Phase 1 (research literature analysis) and Phase 2 (interviews with Scratchers) findings. Information Seeking. Youth in this study showed a greater ownership over their own learning in the digital environment through information seeking. Findings suggested that information seeking is a way of learning or acting that makes young people’s learning more meaningful. The fact that contemporary youth have access to a range of information at their fingertips seemed to increase their confidence in learning new things, including knowledge and skills they have not been taught in school or from adults. A boy who is a Scratch Wiki administrator said that he learned the skills and knowledge needed to develop Scratch Wiki by looking around online: “It was mostly just by looking around the Internet, you know, whether from [the] Scratch website—people post various stuff there—or looking at tutorials at other wikis.” The founder of Scratch Resources mentioned that the development of the online media library “was possible just because there were a lot of useful sites out there,” especially since he had not taken an IT (information technology) lesson in school or elsewhere. So, remixing is a very important part of Scratch. Without remixing, we wouldn’t have been half as cool. And, the good thing is that because of all of this remixing, every single project out there is a tutorial. You can, so if you’re interested in drawing a cake, you can just download a project and that has a cake in it and just see how it works and start playing with it. And, that’s not possible on any other site or platform or whatever. Interviewee: It [working with Scratch] does help because that’s one of those programs where you’re not limited. You can do a lot of things. It’s pretty much putting your emotions in a computer screen. And it kind of helps. It’s kind of relieving in a way. Interviewer: Can you explain the word “relieving”? Interviewee: You can just put it out there, and you know that it’s down there, so you can go back and look at it another time. So if you were feeling sad, you could go there, and you could just make a Scratch and just let it out. Well, the weird [thing] about people collaborating on Scratch is that except for remixing, there is really nothing that helps you collaborate. And, people just find their way of doing it. So, there are Scratch Companies you might have heard of. So, people form a group using a gallery. They usually all just use technologies that were not intended to be used as a collaborative platform. . . . [T]hat also makes collaboration on Scratch cool. People seem to be, they really want to do it and they don’t just do it because it’s there. They find their own way of collaborating. That’s really cool. As far as collaboration, what’s really nice on the Wiki is that you can of course compare the text from the previous revisions, [which] I think is one of the helpful things about collaboration, which you can’t always do, like, maybe you’re in a collaboration and you remake a project. You can’t really see directly what changed. The good thing about the Wiki is that it can be edited by everyone. And, still always stores older versions. So, when someone does something wrong, they don’t have to feel shy or whatever, you can just revert the edit. There’s stuff to help people talk online. It can help you make friendships and things, even without meeting, though it is kind of sad, like oh, you probably will never be able to meet this person. On Scratch, there are the forums. And as you use them, you start to see people and sort of generally become friends with some of them. . . . If we share interest in something, then it helps. And the people that we were in with our collaboration group, they’re friendly. In the modern Internet, you know, here we use emoticons, you know, especially if you’re a kid, you understand, you know, like texting—you understand how to use abbreviations and kind of how people act. And, for example, you end up—people will exaggerate things of course, you know, but it’s all part of the process. Yeah. We also have to, like, when meeting new people, you know, we have to assume good faith. We never try to act—assume that they’re trying to do something bad or assume that they were trying to do a certain thing. So that’s kind of an important thing about being on the wiki. The findings show the ways in which digital youth have an increased sense of control over learning, creative, and social aspects of their life; as Dresang suggested earlier, Net Generation youth are increasingly in the driver’s seat.29 Digital age information behavior offers a new type of learning opportunity, which supports both autonomous and social learning. Information seeking—especially in which youth can choose what to explore in what order in the digital environment—allows them self-taught and autonomous problem solving. Beyond seeking and use, engaging in productive and creative information behavior seems to provide digital age youth with an enhanced sense of empowerment. As information creators, digital youth have a growing chance to be powerful and express their creativity and identity. They also create information collaboratively and contribute to the development of collective knowledge. Moreover, youth feel a sense of agency during their social interactions, especially when their voices are accepted and they can make a meaningful contribution to the information world to which they belong. As demonstrated in the study, Radical Change theory provides a unique perspective to ferret out the potential of non-traditional behaviors to empower youth who are immersed in digital culture. The theory, however, is not naive enough to overlook challenges in the digital environment. While most digital youth appreciate an increasing amount of information at their fingertips, processing a range of information demands a high level of thinking skills and information-credibility judgment. Today’s youth must be equipped with digital information literacy skills in order to have a meaningful learning experience through information seeking. The creative information behavior of youth raises ethical issues concerning ownership as well as the problem of a digital participation gap, because advanced technologies that facilitate creation require a high cost. Collective knowledge can be challenged by quality concerns since anyone without traditional authority can contribute. Furthermore, constant connectivity and increasing online interaction bring up issues of privacy and online safety. The availability of diverse perspectives does not always lead to a broadening perspective or high tolerance when young people’s social interaction is deliberately limited to a circle of like-minded people. Such challenges have implications for the future of Radical Change theory. While the theory may not provide direct applications to all those challenges in the digital environment, Radical Change theory offers a valuable perspective for tackling the difficult issues for both professionals and scholars. The theory guides us to choose an approach to supporting a sense of agency in youth, instead of being intimidated by the dangers of the digital environment and attempting to protect “the innocence of youth” by limiting their access to information and technologies. I believe that the implications of the theory include the significant role of information professionals guiding and supporting digital youth in ways that do not stifle the digital age principles of connectivity, interactivity, and access. The principle of access can be seen as providing the foundation for Radical Change in both information resources and youth behaviors. Dresang explains that “an affirmative regard for Radical Change resources rests in part on a belief that the principles of intellectual freedom (based on the First Amendment) are applicable to youth as well as to adults.” She further suggests that “the danger of withholding information from youth far exceeds the danger of providing it. The onus is on us, the adults who care for and work with young people, to guide them to it, give them the background to sort through it and interpret it, and write, edit, and publish it in books that give them the opportunity to reflect upon and absorb it.”30 Fostering digital youth’s twenty-first-century skills, such as digital information literacy, is key in order for them to truly take advantage of opportunities through the interactive and connected digital environment. I offer the following diagram as a potential way that Radical Change theory can guide future research. It is a framework for studying the information behavior of digital youth, radical resources, and the outcomes for youth in obtaining twenty-first-century skills. Dresang recognized the framework to be “the next step in understanding digital age children’s information behavior and the role of libraries in meeting their needs.”31 The diagram flows from the digital age principles—interactivity, connectivity, and access—to the Radical Change resources and behaviors that represent the principles. It depicts interaction between resources and people. Owing to its emphasis on the synergistic combination of users and information resources in the digital age,32 researchers can benefit from the theory in investigating how digital age resources and changing users interact and influence one another. The theory can also be applied to exploring the effectiveness of Radical Change resources in promoting the twenty-first-century skills of digital youth, just as Pantaleo’s findings proposed that Radical Change resources are tools to teach critical thinking skills, visual literacy, and more.33 Finally, the diagram calls for future research that explores how the interaction between changing resources and youth may have an impact on youth obtaining twenty-first-century skills, because these are critical skills in enhancing a sense of agency in youth by increasing their capacity to learn, create, and socialize. Eliza T. Dresang, Radical Change: Books for Youth in a Digital Age (New York: H. W. Wilson, 1999), 58. Eliza T. Dresang, “Digital Age Libraries and Youth: Learning Labs, Literacy Leaders, Radical Resources,” in The Information Behavior of a New Generation : Children and Teens in the 21st Century, ed. Jamshid Beheshti and J. Andrew Large (Lanham, MD: Scarecrow Press, 2013), 93–116. Eliza T. Dresang and Bowie Kotrla, “Radical Change Theory and Synergistic Reading for Digital Age Youth,” Journal of Aesthetics Education 43 (2009): 94. Eliza T. Dresang, “Radical Change Revisited: Dynamic Digital Age Books for Youth,” Contemporary Issues in Technology and Teacher Education 8 (September 13, 2008), para 2, http://www.citejournal.org/vol8/iss3/seminal/article2.cfm. Sylvia Pantaleo, Exploring Student Response to Contemporary Picturebooks (Toronto Italian Studies) (Toronto: University of Toronto Press, 2008). Dawnene D. Hassett, “Reading Hypertextually: Children’s Literature and Comprehension Instruction,” New Horizons for Learning, March 22, 2008, http://www.newhorizons.org/strategies/literacy/hassett.htm; Dawnene D. Hammerberg, “Reading and Writing ‘Hypertexually’: Children’s Literature, Technology, and Early Writing Instruction,” Language Arts 78 (2001): 207–16. Marta J. Abele, Responses to Radical Change Children’s Books by Preservice Teachers (Capella University, 2003). Eliza T. Dresang, “The Information-Seeking Behavior of Youth in the Digital Environment,” Library Trends 54 (2005): 178–96; Eliza T. Dresang, “Radical Change,” in Theories of Information Behavior, ed. Karen E. Fisher, Sanda Erdelez, and Lynne McKechnie (Medford, NJ: Information Today, 2005), 298–302; Eliza T. Dresang and Kyungwon Koh, “Radical Change Theory, Youth Information Behavior, and School Libraries,” Library Trends 58, no. 1 (2009): 26–50. Kyungwon Koh, “Theory-to-Research-to-Theory Strategy: A Research-Based Expansion of Radical Change Theory,” Library & Information Science Research 64, no. 9 (2013): 1826–41, doi:10.1016/j.lisr.2012.09.003; Kyungwon Koh, “Adolescents’ Information-Creating Behavior Embedded in Digital Media Practice Using Scratch,” Journal of the American Society for Information Science and Technology 64, no. 9 (2013): 1826–41, doi:10.1002/asi.22878. MIT Media Lab, “Scratch: Imagine, Program, Share,” 2012, http://scratch.mit.edu/. IJIMS, “Interactive Journalism Institute for Middle Schoolers,” 2010, http://www.tcnj.edu/~ijims/. Brenda Dervin and Rea Devakos, “Deep, Efficient, and Dialogic Study of Undergraduate Information Seeking and Use: A Methodological Exploration,” 2010, http://communication.sbs.ohio-state.edu/sense-making/asist2010poster.pdf; Brenda Dervin, “Focus Groups for Participatory Research: Design Using Systematic Dialogic Principles Drawn from Sense-Making Methodology,” 2007. Amanda Lenhart et al., “Social Media and Mobile Internet Use among Teens and Young Adults,” 2010, 26–27, http://www.pewinternet.org/Reports/2010/Social-Media-and-Young-Adults/Summary-of-Findings.aspx. Mizuko Ito et al., Hanging Out, Messing Around, and Geeking Out (Cambridge, MA: MIT Press, 2009). Rebekah Willett, “Consumer Citizens Online: Structure, Agency, and Gender in Online Participation,” in Youth, Identity, and Digital Media, ed. David Buckingham (Cambridge, MA: MIT Press, 2008), 49–69. Susannah Stern, “Producing Sites, Exploring Identities: Youth Online Authorship,” in Youth, Identity, and Digital Media, ed. Buckingham, 95–118. Ito et al., Hanging Out, Messing Around, and Geeking Out. Sandra Weber and Claudia Mitchell, “Imaging, Keyboarding, and Posting Identities: Young People and New Media Technologies,” in Youth, Identity, and Digital Media, ed. Buckingham, 25–47. Dresang, “The Information-Seeking Behavior of Youth in the Digital Environment,” 20. Cecilia R Aragon et al., “A Tale of Two Online Communities: Fostering Collaboration and Creativity in Scientists and Children,” Proceedings of the Seventh ACM Conference on Creativity and Cognition, 2009, 9–18. Dresang, “Digital Age Libraries and Youth: Learning Labs, Literacy Leaders, Radical Resources,” 112. Pantaleo, Exploring Student Response to Contemporary Picturebooks. This entry was posted in Eliza T. Dresang Memorial Issue, Volume 5: January 2015 and tagged digital youth, eliza dresang, radical change theory. Bookmark the permalink.